GRAPEVINE (WBAP/KLIF News) – The Southwest Airlines pilot who helped land a Dallas-bound flight that suffered a deadly engine explosion two months ago said getting the plane down safely was a team effort. Jennifer Riordan was killed on Southwest Flight 1380 back in April, when the engine explosion sent shrapnel flying through a window which led to her being partially sucked out of the plane. 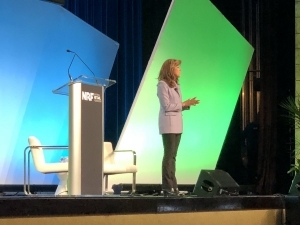 Speaking at a National Retail Foundation Conference in Grapevine, Captain Tammie Jo Shults said landing the plane wouldn’t have been possible without having established camaraderie with her flight crew and trusting them to do their jobs. “I found that serving my people by getting to know them on an everyday basis is what pulls us through crisis,” she said. “You play like you practice. I mean, if its a habit that you do it in your everyday management then it will be a practice for you to do it through a crisis,” she said. Since the incident, Shults gained national praise for her calm demeanor and efforts in saving dozens of lives. Shults said she returned to the cockpit last month. It was the first time since the fatal flight. Although the she has returned to her normal routine, Shults said she will always carry the memory of what happened that day and the life that was lost with her.